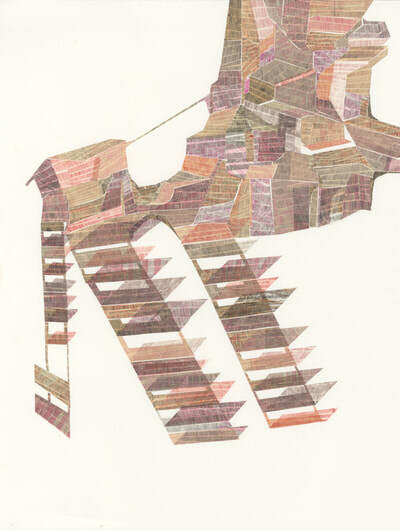 Seattle-based printmaker Kim Van Someren builds wondrous architecture which defies physics. Her awkwardly rambling structures either lurch forward on impossibly small pins, or stand supernaturally affixed to the ground. Their impractically cantilevered extensions catapult themselves beyond the frame, while others appear to be untethered and hovering in air. Some present themselves as complicated intertwined tiers of balconies, mezzanines, steeples, and ladders; strands of overlapping rope, drapes, and banners festively decorating their towers; or cascading down towards some unknown terrain. Kim Van Someren's aesthetic engineering is as much a kind of wayfinding as it is the formal inquiry of a material body. For her solo exhibition, Into Its Own Echo, she accumulates an inventory of prints on delicate tissue, or Japanese kitakata paper, to cut up and reuse as collage elements. In building these new forms, she works intuitively through the pleasure of composing and aligning her shapes towards the figure she wants, while allowing for both a sense of visual adventure and deep contemplation. Her markmaking is a textural component which grounds the figure in space and adds substance, weight, and corporeal presence. As we play along with Van Someren in guessing what these almost-familiar objects might be, and to what purpose they serve, we engage with her sense of investigation and exploration into what is possible when such structures become animated. My introduction to Van Someren’s work was through her series of forts and houses in 2010. Forts and houses imply the presence of humans. Humans imbue such structures with ideas of home, family, community, and gathering; of presentiment, stability, displacement, and location. Their purpose implies protection and security, an idea fraught with tension; particularly for those whom are historically either denied the solidity of a place to call home; or relegated to the dwelling, and disallowed to venture beyond it. Therefore I was mystified by the edifice of these dark and foreboding structures. Were they built to keep someone out? What or whom were they protecting, or confining, within? There were rarely any windows or doors. They sometimes resembled treehouses. Were they silos? What did they carry? There is either a playfulness or a foreboding in the way they lean, slump, and stand. They’re darkly monolithic, floating in space, and cast no shadows; therefore they are ungrounded and dislocated from land, place, or people. Often, a ghostly imprint appeared above or just behind the figure as a tracer; a marker in time of where this structure has been, or a Futurist projection of its intended travel. This echo of a form’s presence implies its movement away, or towards, someplace else. Where will they, and we, go from here? For Into Its Own Echo, the reverberation is found in the physical reiteration and repetition of the image itself, rather than the suggestion of a trace as before. Van Someren employs the method of replication directly by creating an abundance of pre-printed source material, each of these being duplicates upon duplicates; and cutting them into pieces which she uses to compose a new image. 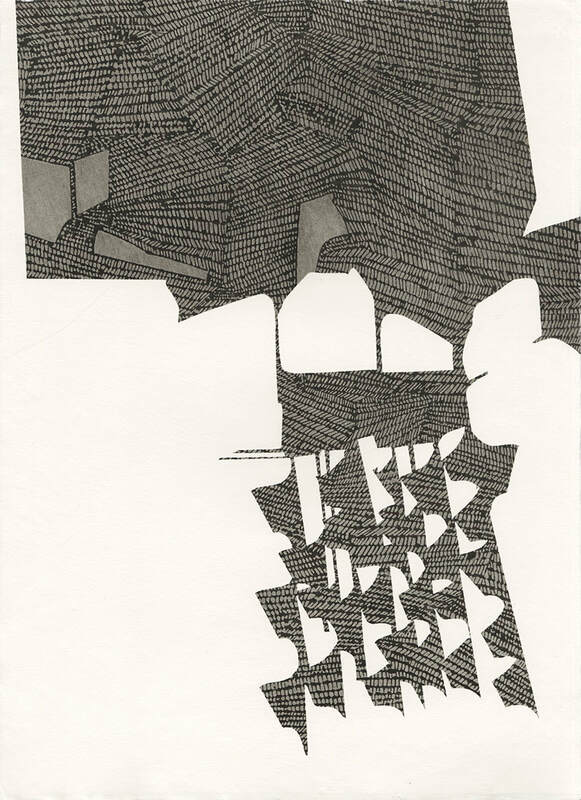 It appears first as a collage, and subsequently as an intaglio print. Van Someren maximizes the replication within each composition through the use of overlapping planes, transparent layers, the accumulation of repeated lines and material, and the kinetic potential of multiplied pieces. Subtle shifts in tone, color, and number of transparencies define the relationships of the shapes themselves, and either denote the very form of the structures, or remark on the empty space around and between them. Further complicating the replicated image are Van Someren’s additional series of aquatint and sugarlift prints, converting the collaged form into a shadow of its progenitor. The intaglio prints trigger a memory, creating a moment of pause in which we must stop and look harder, after which the black and white printed image renders itself graphically on the page like a retina burn. As the burn softens and we look closer, we see slight variances of the original to create an entirely new, standalone image in sharp relief. Is this the same structure we saw before? Is this the same structure as the one next to it? The effect is like experiencing deja vu, a glitch, a hiccup in reality. We must look, and look again. Therein lies the echo, a ghostly chimaera made of all the parts that came before, ready to venture forth or stand its ground. These new architectures offer up a more certain feeling of optimism for the future than Van Someren’s former series of forts and houses. While some mystery remains, and these structures are still certainly dark and guarded beings; they offer up a quiet presence which makes room to house not just humans, but humans’ feelings of desire for solidity while traversing this restless, shifting ground. The dwelling both contains and embodies the human, in some ways becoming a stand-in for the figure, or community of figures. The delicacy of their construction belies the strength of their persistent presence—each component amasses to build beautiful but formidable structures capable of their own defenses. Each becomes an autonomous entity with a proud stature, reaching upward towards the sky, loosening their barricades to form intricate balconies, their walls opening wide into airy windows overlooking new vistas. Banners wave in the air, signaling victory. These structures are dynamically in motion, marching forward. They beckon us to join, and follow. Where will they, and we, go from here?